Locking Village is on the edge of the Somerset Northmarsh, which was flat low-lying marsh land stretching from the northen edge of the Mendips bounded by the coast to the West, hills beyond Congresbury to the East and up to Clevedon near Bristol. Over the ages the land was drained by ditches called Rhynes which created moors crossed by ancient hollow ways and drove roads for taking cattle between summer and winter grazing. The land frequently flooded and small farms and settlements grew where there were rises above the flat moors. The land between Grumblepill Ryne and Locking Rhyne became known as Locking Moor and the name is believed to have derived from the settlement of 'Locc's people'. Locking Head is on ancient track across the moors once known as 'Roman Way'. 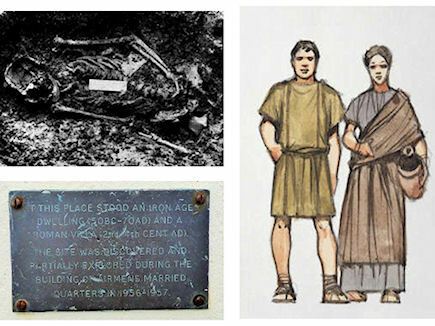 When nearby RAF Locking airmen's houses (now Flowerdown) were built the remains of a circular hut, pottery and a skeleton dating from the Iron Age 50 BC – 70 AD were discovered. The hut had been destroyed around AD 250 and replaced by a rectangular building 85ft long x 35ft wide. It was an aisled house of a distinctive type of architecture used in Roman Britain for housing workers on villa estates. Around AD 300 the villa was enlarged and a bath house built at one end of an aisle. The hot room for this had a well preserved hypocaust system and plastered walls decorated with yellow and green dots and lines on a white background. The box flue tiles may have come from the Roman pottery at Congresbury. Three small human skeletons were found buried under the floor of a bath house and are known as the ‘Locking Babes’. They can be seen in Weston's musuem. A small plaque near Anson road marks the site of the excavation. On Carberry Hill by Locking Head the outline remains of Locking Castle can be seen. This was a 'Motte and Bailey' castle built around 1100 in Norman times possibly to guard the way across the moor from Woodspring Priory, though Worle to the small port of Uphill on the coast. The ‘motte’ was a wooden tower or keep, and the ‘bailey’ an enclosure surrounding protected by a wooden fence and ditch which could be inhabited by both animals and people in event of an attack. The site may also have been used in later medieval times. Excavations in 1902 found the remains of a small stone chamber, pottery, remains of a sword and a coin from the reign of Edward IV. The castle site stands on private land but can be seen from Anson Road. 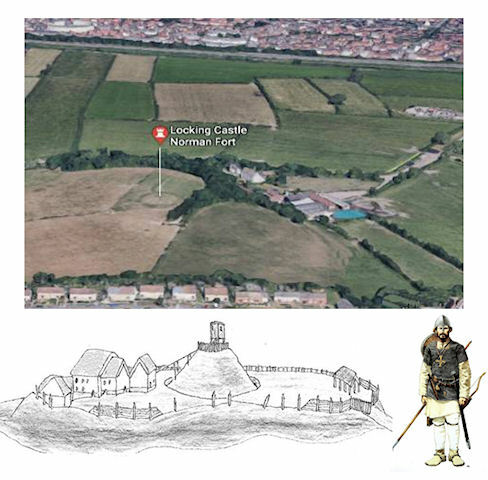 The surrounding area North of the site up to Worle is still known as 'Locking Castle'. 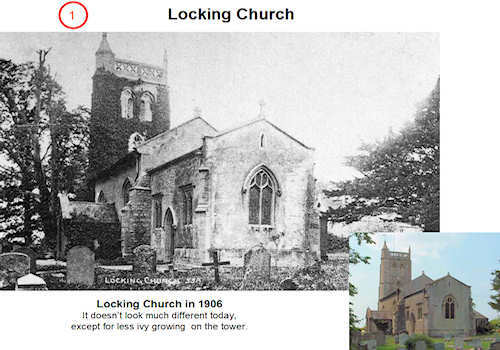 Locking is not mentioned in the Domesday Book in 1086 but it became part of the estates of Woodspring Priory who established St Augustine's church at Locking in the 1200's. The carved Norman church font dates from this time and the tower from 1380. Norman descendants became prominent in the community and some of the earliest documents available list the following landowners who donated gifts of land to Worspring (Woodspring) Priory: William de Courtenay, Henry de Pendeney and Richard de Hordwell. It is possible that William de Courtenay became the first Lord of the manor of Locking. Locking remained the property of Woodspring Priory until the Henry VIII's dissolution of the monastries in 1536, and had several owners prior to the Plumley family who came here from Dartmouth around 1600. 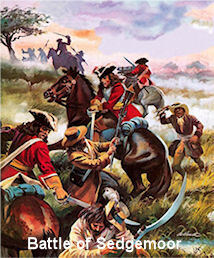 According to legend, in 1685 during the Monmouth Rebellion John Plumley fighting for the Duke of Monmouth against James II escaped from the defeat at the Battle of Sedgemoor and returned to Locking pursued by the King's men. He hid in the well at the Manor house but was given away by the barking of his dog and was hanged on a nearby tree. His wife, overcome by grief and shock, threw herself and the dog down a well in the garden. 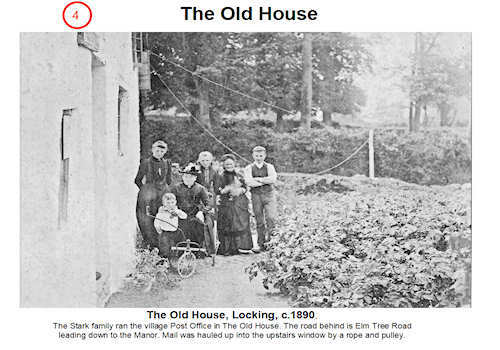 It is said that his ghost still haunts the Manor and the Coach House inn. The facts are somewhat different. William, John's brother, was Lord of the Manor at the time of the Rebellion, but lived at Locking Head Farm, his brother occupying the Manor House. William gave horses to the rebels and was brought to stand trial at Wells, and convicted of High Treason. He was imprisoned there awaiting execution. He as granted a reprieve but died of gaol fever before his release. Locking manor, including nearly all the houses, farms and land, was confiscated by the King and belonged to the Crown. It became owned by the Society of Merchant Venturers from Bristol. They used rents from land they owned to fund voyages from Bristol to the New World of America. 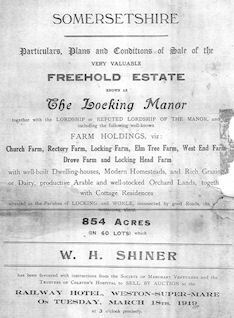 It was not until 1919 when the farms of Locking were auctioned off by the Merchant Venturers and returned to private ownership mostly to the existing tenants. Locking was a farming community. In 1822 there were 26 houses and 35 families of whom 30 were employed in agriculture. There were 6 farms - Elm Tree Farm, Locking Farm, Manor Farm, Church Farm, Locking Head Farm and West End Farm. 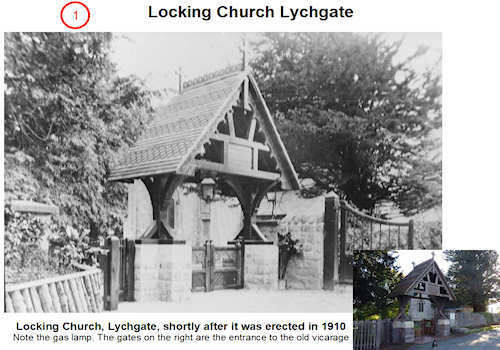 19th century Locking must have resembled the type of rustic scene so beloved of Victorian artists: a farming community living in thatched cottages with village ponds and orchards presided over by the Manor House and church. The villagers lived from what they farmed and grew. There was an apple press at Church Farm to make cider. Up until 1850 all the houses in the village except the Manor House were thatched, and we had our own Thatcher called James Fisher. 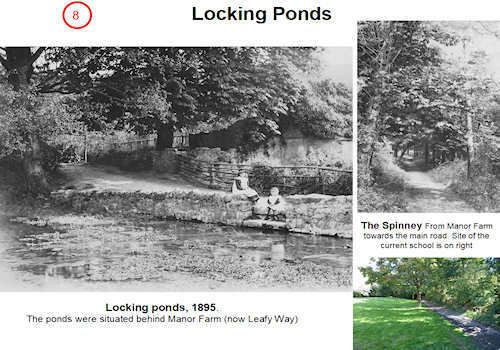 The ponds, in the area of Leafy Way/Manor Court didn’t disappear until the early 1960’s. 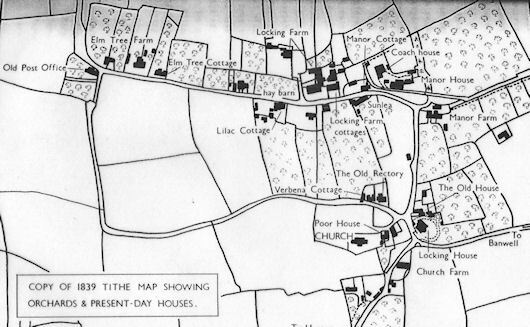 The Tithe Map of 1838 and an Ordnance Survey map of 1883 also show the many orchards in the village, but living conditions were doubtless far from idyllic. The village had its own Poor House next to the church until 1856 for those unable to pay rent. 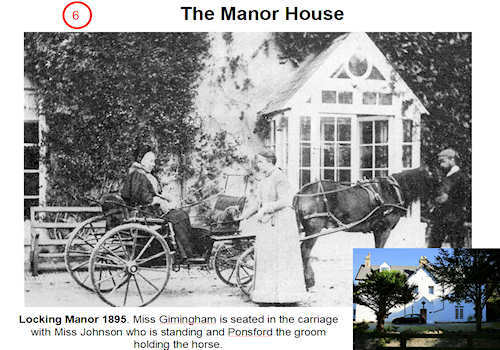 Miss Gimingham lived in the Manor House in the 1890s. She was a remarkable lady who was a keen photographer of life in the village, organised a village band, gave generously to the church and held woodworking classes producing carved panels which can still be seen in the church. 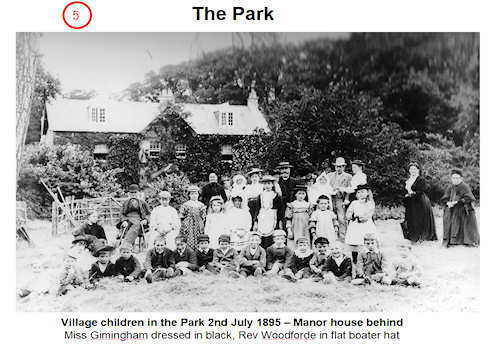 Miss Gimingham in the black dress and the vicar Rev Woodforde with a beard and flat boater hat can be seen in the 1895 photo taken in the paddock (now the park) in front of the Manor house. 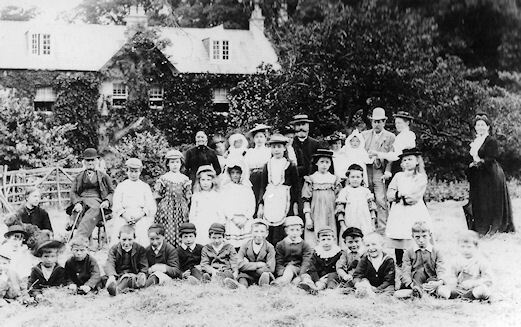 In 1910 the village school had around 20 children and one teacher Miss Florence Clark. All the children were taught together in the same room and learnt reading, writing and numbers. 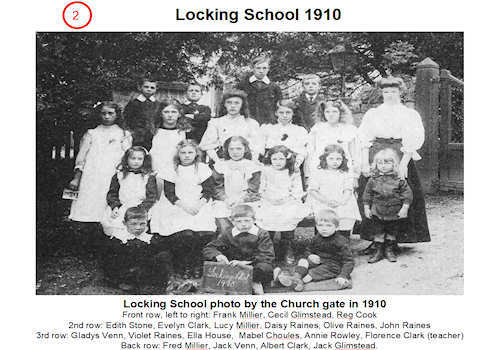 In 1897 the school leaving age was raised from 10 to 12 years old, and there was also singing, sewing and art lessons. Once a year they were tested by an inspector. The old school room and teacher's house still stand opposite the church, and the families of some of the descendants of the children still live in the village. Locking was relatively unaffected by the rapid growth of nearby Weston-super-Mare ('Westo(w)n-above-the sea') which, with the coming of the railway in 1841 and the Victorian's love of visiting the seaside for health and recreation, grew rapidly from a small fishing village to a sea-side resort. In the early 1900's life in Locking had changed little. It was a village of small farms. Milk was also delivered locally, firstly by the Millier family and later by the Stephens' at Elm Tree Farm, the round being taken over in the Second World War by Mr and Mrs Heal at Church Farm. There was more traffic through the village but this came from outside as in 1933 there were only two residents with motor cars - Dr. Brady at the Manor House, and Mr Harris from Manor Farm. 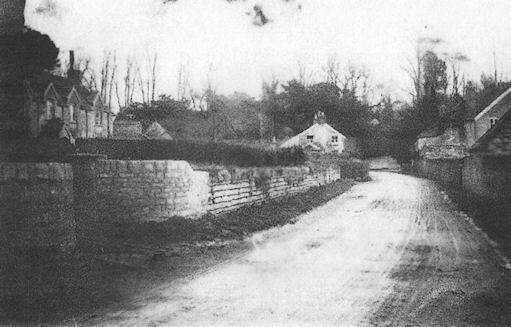 A by-pass road (now the A371) was opened in the 1936 to the North of the village to relieve the traffic through the village's narrow road (now Elm Tree Road). In 1937 Weston's airport was opened on Locking Moor near West End Farm, with regular flights to Cardiff, Bristol, Birmingham and Bournemouth. It soon became one of the busiest airports in the country and by 1939 over 36,000 people had flown from Weston airport. Like many villages Locking was affected by the 1st and 2nd World wars. In 1917 during WW1 John Glimstead, born and married in Locking, was killed fighting in the trenches near Ypres. His memorial plaque is in the church. WW2 had a large impact on the surrounding area. In 1938 the Air Ministry purchased farm land to the North of the village and built RAF Locking which opened in 1939 to train aircraft technicians. During the WW2 RAF Locking grew into a huge hutted camp where there could be 4,000 students in training to support the growth of the RAF. Satellite camps were built at Knightcott and Summer Lane. The airfield was taken over for military use, and 'shadow' aircraft factories were built at Oldmixon and Elborough where the Bristol Aeroplane Company manufactured Bristol Beaufighters and other aircraft. The main road past Locking was widened and staightened so that completed aircraft could be towed to the airfield for flight test and delivery. Locking had its own 'Dad's Army' Civil Defence Volunteers with Dr. Bray from the Manor house in charge. There were two public air raid shelters - one at the western end of the village and the other in Old Banwell Road, and a Barrage Balloon near the junction with the Hutton road. The vicarage was the headquarters for the Balloon Barrage, and 'Winterstoke' in Old Banwell Road became a medical centre. The most action they saw was in June 1942 when bombs were dropped on Hutton hill, their target being the Bristol Aeroplane Company factories at Oldmixon and Elborough near Banwell. In 1946 Locking's vicar found himself chaplain to 200 German Prisoners of War interned at Knightcott camp. After the war the airfield on Locking Moor became home to Bristol Helicopters who designed and made helicopters for civil and military use. The Bristol Sycamore and Belvedere were amongst the most advanced helicopters in their time and the site became an important centre for helicopter design and production. In 1961 it became Westlands who were a major local employer until 2003 when the factory was closed. The Helicopter Museum on Locking Moor airfield opened in 1989 has an extensive collection of historic helicopters. The factory at Elborough produced missile motors during the Cold War. RAF Locking became the home of RAF ground technician apprentice training and the No.1 Radio School. Ten of thousands of airmen wnd women were trained at Locking. The village had a close association with the RAF camp - some of the staff lived in the village, children from the camp attended Locking school, and there were regular events on the camp for local people including Flowerdown Fair flying displays. Farming continued to be at the heart of the community until the 1960's, and it was still being practised in the centre of the village until the 1970's when a hay barn fire at Locking Farm brought about its demise. In the 1950's sheep were still driven along Elm Tree Road to pasture in the playing field, (now the Park), during the winter months. The Hutchings family carried out market gardening on the southern slopes of Old Banwell Road from the 1930's to the 1960's, and the Millier family had a haulage business based at what is now Elm Grove. The Post Office, originally at 'The Old House', moved to 'The Old Post Office' (now 'West Holm') at the western end of the village in 1920, to Grenville Avenue and now to Manor Court shops. The most obvious change to affect Locking was its proximity to the rapidly expanding town of Weston-super-Mare whose popularity as a holiday resort and commercial centre plus since 1967 access to the M5 motorway made the village an ideal place to settle. The first area to be developed was the northern side of Elm Tree Road in the 1930's followed by Old Banwell Road and The Green. More infilling along the south side of Elm Tree Road occurred during the 1950's along with the building of Grenville Avenue and associated roads. 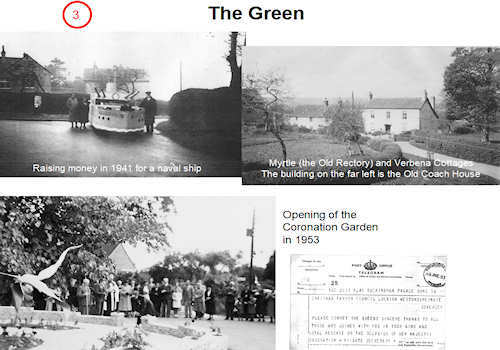 The 1960's saw the sale of farmland for Mendip Rise, Beechwood Avenue and South Lawn. The Orchard and Homefield followed in the early 1970's along with smaller amounts of infilling in the proceeding years. The current Locking Primary school was opened in 1966. Nearly all the original buildings shown in the 1839 map still stand although the farms and orchards have gone. 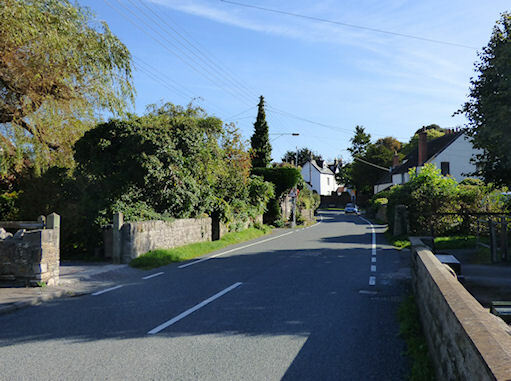 The village still has the church, school, post office, a few shops, a cafe, pub, village and church halls, and maintains a village identity. 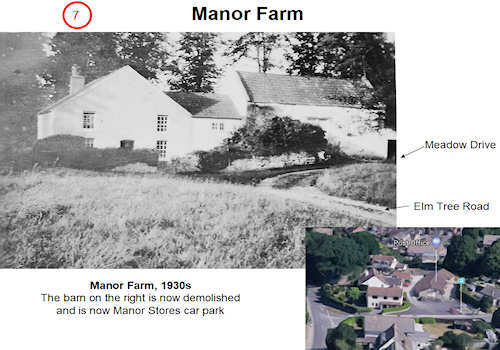 The Manor house was run as a Country Club in the early 1960's, before being converted into flats. The coach house is now the Coach House Inn. There are still (just) green fields separating the village from the encroaching suburbia of Weston-Super-Mare, however much of the surrounding area has been infilled with housing estates. New houses on the area north of Locking castle merge into Worle. The factory at Elborough was demolished in 1997 and replaced with houses known as Elborough village. A new housing estate called Haywood village is being built on Locking Moor airfield. RAF Locking to the north of the village closed in 1999. The officer's and married airmen's quarters were sold off as private houses and are now known as Flowerdown and Locking Grove. The buildings on the main part of the site were demolished in 2003 leaving only the chapel and water tower. It is now called Locking Parklands and is being developed with new houses. 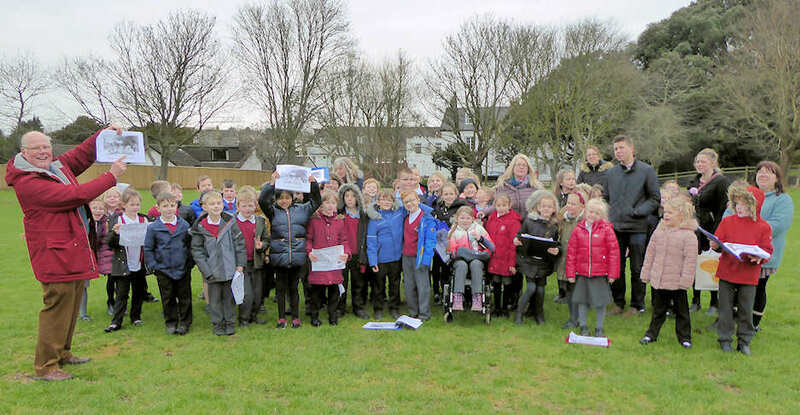 Children from the houses on the former RAF site still attend Locking Primary school although a new permanent school on the Locking Parklands development is promised for the future. 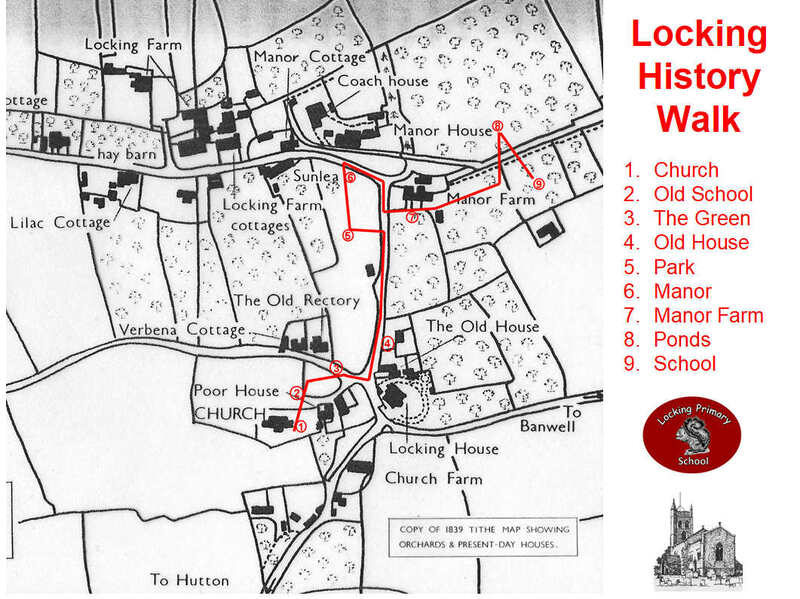 In February 2019, children from Locking School Years 3 and 4 went on a History Walk around Locking village as part of the Heritage Project. 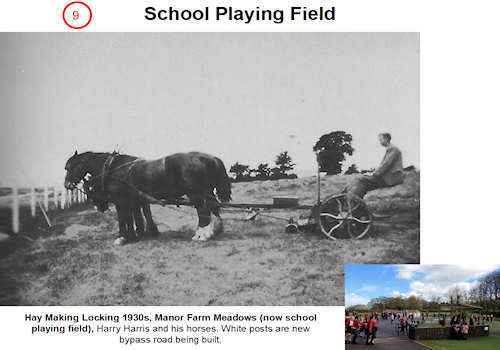 Starting at the church and ending at the school they stopped at points along the way to look at old photos to see how the village has changed since Victorian times. A map of the walk and some of the photos are shown below.